The final passengers have flown into Coventry Airport as an airline ended its operations there. 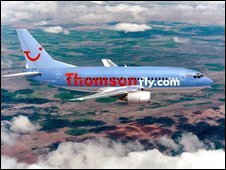 Thomsonfly's last scheduled service arrived in the city from Malaga in Spain on Sunday afternoon. The airline said the increased focus on charter holiday flights, rather than on scheduled ones such as those operating from Coventry, had led to the decision. Coventry Airport has pledged to continue a legal battle to build a new passenger terminal at the airport. It announced it would appeal against a High Court judgement which ruled against the scheme in October. Thomsonfly which ran the only passenger service at the airport, began operations there in March 2004. The airport has said that it regretted but understood the airline's decision. Executive chairman Brian Cox said "the length of time and inordinate cost involved in seeking improved terminal facilities" had not helped the situation. However, Roger Fawcett, vice chairman of Baginton Parish Council, welcomed the end of the passenger flights and said the aeroplanes' noise had disturbed villagers. The airport's business aviation and cargo operations will continue.